Conditioning and building strength is important for all sports. It is especially important when an athlete gets to a competitive level. Gymnastics is no different. Many coaches wait until their athletes are in a competitive level before they really start working on serious conditioning and strength. Those coaches probably experience a frenzy to try to get their athletes stronger in a relatively short amount of time. Strength building exercises are just as important in the beginner levels as they are at the competitive levels. Now here is the big question: How do you get preschool and beginner school age kids to condition? They aren’t training for the Olympics, so why would they want to spend their magic hour of activity doing conditioning drills? You have to make it fun. Conditioning should never be used as a punishment. It should always be seen as an opportunity to get stronger, and therefore better. The easiest way to do this? Make it a game! Anything can be a game if you have even a little bit of a creative spirit. And if you don’t, well below are some awesome and easy ideas. Use lots of props! Kids love toys, so the more toys you can include the better. Let them hold the toys between their feet and jump, or hang from a bar and lift the prop with their feet. They can pass the toy from their feet to their hands and back again. Anyone have any old Beanie Babies at home? These make great props, because they are the perfect size for little feet. Obstacle courses are your friend. Climbing over things and crawling under things builds essential core strength. Crab walking builds upper body strength. Put a toy on their bellies and have them crab walk to a bucket. The same thing can be done in a push up position, with a toy on their back. Hanging games build strength naturally. You can do all kinds of variations such as tuck hangs, straddle hangs, and pike hangs. These build hand, upper body, lower body, and core strength. Mat pushing relay races are a great way to build strength. You can vary the size and weight of the mats depending on the children’s ages and abilities. Making it a relay makes it exciting and adds a competitive aspect. 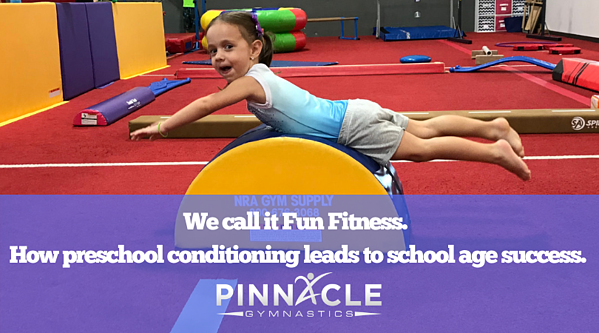 School age gymnastics conditioning can also be tricky. You can also try these in tumbling classes! The kids only have so much time during a recreational class. In addition to the time constraint, there is also the fact that most kids have not built much strength. Coaches must start slowly, and build. The best way to get strength training in is to turn it into a warm up game and incorporate it into each event. Board Games – Run, crab walk, bear walk, push up walk to put a piece on the game board. Modified leg lifts – Kids can sit with their back against the wall in a pike position and use their feet to lift a ball up and over a cone and back again. Cartwheel Hops – Kids place their hands on a low beam and hop their feet side to side over the beam. This helps build ankle strength. To make it more fun or challenging you can add a prop for them to land on or jump over. 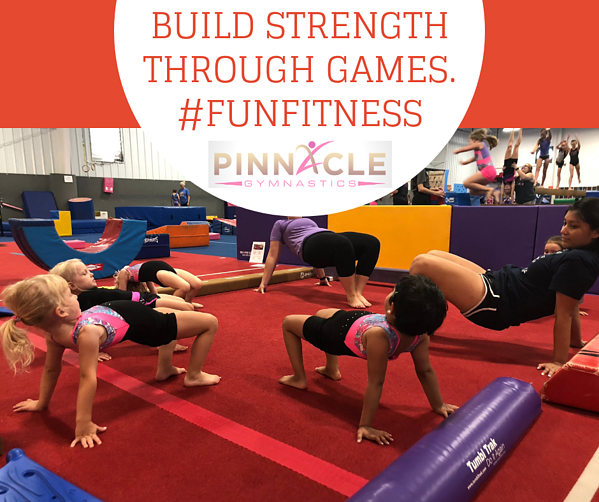 Bear Walks – Bear walks on the beam are great for building arm strength and core strength.It is also a great way to build balance. In addition, it is really challenging! 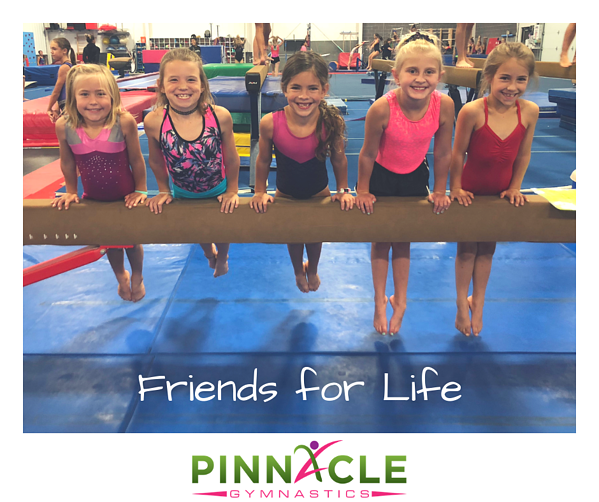 Front Support – Kids can practice their front support position from Bars on a balance beam.This is often less scary for beginner kids, and helps build confidence along with strength. Sleeping Runners – Kids start laying down on their bellies, then have to stand up, turn, and run to get to the springboard. Slider Skating – Kids “ice skate” using sliders or Frisbees. This straight-leg running motion helps to activate hamstrings. Block Jumps – Kids jump with feet together onto a block. Variations can be made adding blocks and changing the height. Panel Mat Log Rolls – Put two panel mats side by side with a gap in the middle. Place plush toys in the gap. Kids must log roll across the mats without squishing the toys. Partner Sit Ups – Partners sit facing each other and pass a ball or toy back and forth with every sit up. Whether participating in soccer, tumbling classes for kids, or other just looking to improve your overall wellness, conditioning is a vital piece of the puzzle. Conditioning and strength building is an important aspect of all sports. It doesn’t need to be left until an athlete gets to a competitive level. Turning conditioning into games is the best way to get kids excited about the opportunity to get stronger. A conditioning program will always be best when it is used for fun. 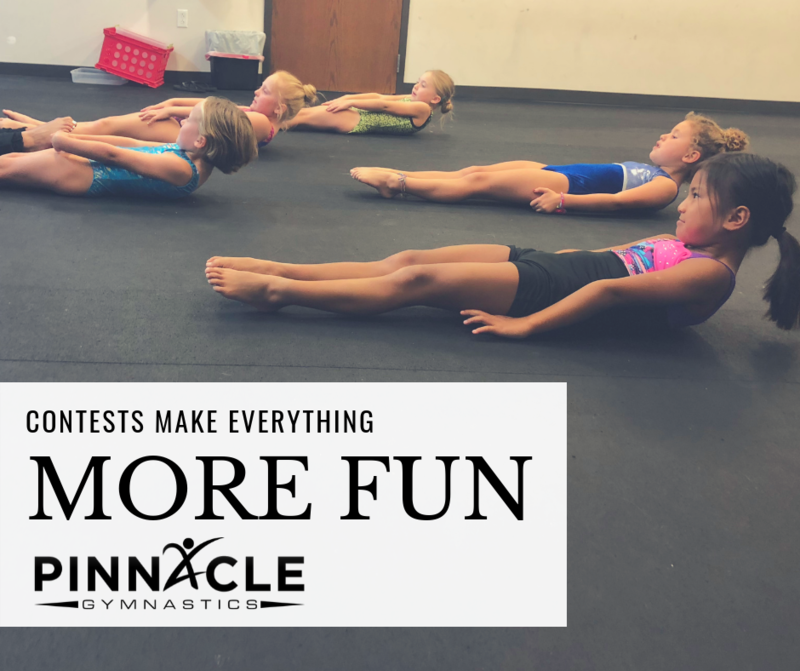 Learn more drills to improve a back handspring at home.